Anger of the Gods – Anger of the Gods shot up to 500 yen over here in Japan not too long ago and is still buylisting for about 250 yen, but for some reason it’s only $2.50 back in the USA. That gives me a $1 loss on that speculation, but at least I made some money selling mine at its peak. Don’t think we’ve seen the end of it yet. Chandra Pyromaster – Chandra’s been showing up in sideboards here and there thanks to her 0 ability, but I’ve seen more players than normal use her -7 as well. I attribute this to burn decks in Jeskai colors, as well as Mardu Planeswalkers decks. She went up a smidgen from $7.75 to $8.25. A win in my book. Goblin Rabblemaster – I said to sell at $19.50 because the price was going to stablize somewhat lower, and if you did you made some profit. He’s now closer to $15 like I said he would be. It’s still a 2000 yen card here in Japan however. Prophetic Flamespeaker – I said it wouldn’t able to sustain that $5.25 price tag without seeing any play, and I was right. Only about $2.75 now. Boon Satyr – Boonie still sees play from time to time as a 2 of in some green decks, but I thought he was going to see a bit more play. Down to $1 from $1.25. Genesis Hydra – Yikes, he lost almost half of his value since last time, settling at $1.75 from his previous value of $3. I guess he didn’t see any play last standard season though. Nissa, Worldwaker – My recommendation was to sell at $41.25, and boy was I right. She dropped like a rock as people jumped ship on green devotion decks. She’s hit about 2500 yen over here in Japan, but has dipped even further to $19.25 in the USA. A little bit lower than I expected, but still a good call on my part. Chord of Calling – “the current value of $8 is being held up by Pod decks in modern”, well didn’t see that coming. It’s value is less than half what it was before, in no small part thanks to Birthing Pod being banned. Couldn’t have predicted a drop to $3.25. I think I was about 50% accurate with these picks last time, but in my defense a lot of the prices of cards I chose didn’t change much or even kept their value longer in Japan than in the USA. I guess it’s true what people say about Japan being slow to change ^_^. 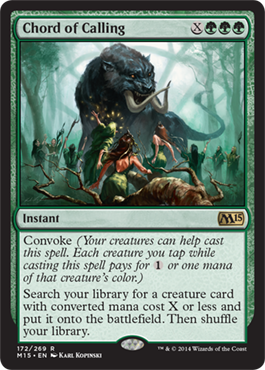 Anyways, lets take a look at what green and red have in store for us during Fate Reforged. While I’m not going to push it hard, I think Anger of the Gods at $2.50 is a good pick up. The card is bound to have another spike before rotating in the fall, and I wouldn’t be surprised to see more Token and aggro decks during this season than before. It should also be noted that if Modern sees more creature based aggro decks, Anger of the Gods could see play there. Keep your eye on this card. If we take a look at the Fate Reforged set as a whole, then we can see that the ferocious ability has gotten a serious injection of enablers in this set. Yasova, Temur Sabertooth, the dragons, etc. 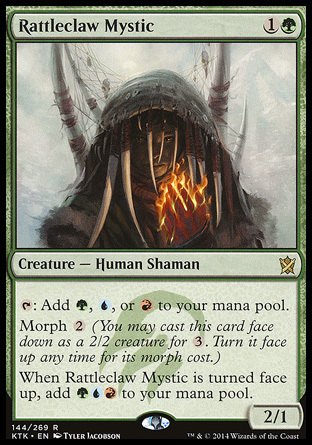 GR Monsters should be just as intimidating as it ever was, and Temur might make a comeback as well. 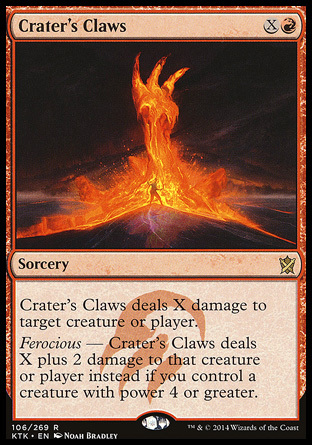 My spec this time is Crater’s Claws at $1.25. I’m going to spec that it will double to $2.50 by the start of the next set in standard. Seems like a good win condition in ramp decks too. BUY BUY BUY BUY. Dear lord this is a steal at $12.75 right now. 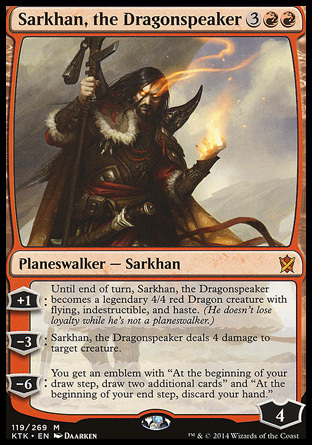 His value is only going to go up in a set called DRAGONS OF TARKIR, and I see him being really powerful in GR, Naya planeswalker, and of course Mardu decks this season. He won’t hit $30 again in his standard life, but I wouldn’t be surprised to see him around $15-16 in a few months, and even higher than that this summer. Trade for him, buy one or two . . . get at least 3 if you plan to play him in standard. You’ll save a lot of money by doing it now. There is a chance he can drop down a little more, but all it will take are some good finishes and his price will jump again. Something else to think about, but when he becomes a Dragon he also activates any FRF dragon’s power that you have in play when they attack together. Other cards I think you should watch out for are: Ashcloud Phoenix ($4), Eidolon of the Great Revel ($5.25), and Stormbreath Dragon ($14). In the right format these cards could see another spike this summer. Stormbreath is a good finisher in a BR control deck playing Crux of Fates, Eidolon could see more play if it does well in Legacy and Modern this spring, and Phoenix is just a solid overall card, especially against control which could see more play. Keep an eye out. Chord of Calling ($3.25) is in a tough position now. Birthing Pod was banned, and because of this shake up the card lost more than half of its value. Many pod players were left destitute, aimless . . . but I don’t think that will continue for long. While some people will take apart their deck and sell it off, I believe other players are going to focus on a strictly Chord deck. They’ll use various types of powerful one ofs along with the mana creatures from Pod such as Birds of Paradise, and maybe even put Domri Rade into Birthing Pod’s spot. While this kind of deck seems unlikely, if you didn’t sell your Chords when they were higher, I’d recommend holding onto them now. I think it’s good to silently pick up a playset while they are cheap, and if you can get them for under $2 do so. I don’t think it will go up by the next set, but I do think it’s a good investment. Courser of Kruphix ($10) still maintains a decent value, even in a metagame where it saw much less play. The card shows up from time to time in other formats such as Modern, and I think there is another spike out of it in standard before it rotates. I wouldn’t wait until summer, but if you see it hit $14-15 again this spring, trade 1 or 2 away to get some value out of them. I don’t see it staying above $10 after rotation in the fall. Eidolon of Blossoms ($1) is another card to look out for. Stores in Japan are buylisting it for 100 yen now, and if Temur Ascendancy Devotion Combo takes off, the pressure of that deck and GB constellation/Whip could cause the card to go up a little bit. Not much, but I could see it at $2-$3. Speaking of the Temur Ascendancy combo deck, if it does see more play I’d expect Genesis Hydra ($1.75) to double in price as well. It’s a fun card, and should hold casual demand after it rotates. Good investment I think. Polukranos, World Eater ($6) might see another spike as well thanks to this deck, so when it happens get rid of yours if you can. As for Hornet Queen, I think this standard season is when you want to get out of it. I don’t see it going much higher than $5.50, and as more graveyard hate strategies become apparent I expect it to see less play. Give it another month then sell/trade them away if you can. Rattleclaw ($1.50) seems like a rather safe pick up. It sees play in Jeskai Ascendancy Combo and other ramp decks, and I could see it going up in price if ramp decks improve in the new standard season. I doubt it will see Sylvan Caryatid prices once rotation times come around, but I think it will definitely go up in price by summer. Now’s a good time to get your playset. That will pretty much do it for red and green this time. There is a lot of potential in these colors, so keep your eyes peeled on results and make sure you jump on those that are undervalued before they become out of reach. There are other cards I didn’t mention, but I don’t think it’s time for them to shine yet. There are quite a few cards I expect will go up, but not until we get closer to rotation time in the fall. Next time I’ll be talking about the remainder of cards in standard that we haven’t covered yet: Artifacts, Lands, and Multicolor cards. There’s lots of money to be made in those categories, so be sure to join me soon for the final article in the Bang for your Buck series! See you next time!